It was not the belief in Jesus Christ that Bruegel was criticizing in his pictures, but rather the Catholic Church. For centuries past, churches and monasteries had been among the most important clients commissioning art. The Reformation put an end to this tradition, the Protestants considering the rich pictorial ornamentation of Catholic buildings to be symptoms of secularization, or even of a forbidden display of magnificence and power. Theological objections were also raised, albeit not by Luther but by Calvin. 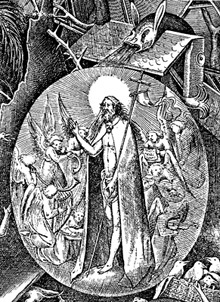 Maintaining that "every pictorial representation of God contradicts His nature", he stated that "it is sinful to give God visible form; to create graven images is to completely break away from the true God." Bruegel worked with others on an altar in his early years, in 1550/51; we know this from documents, although the altar itself is lost. As far as can be ascertained, not one of his paintings was executed for a church. One reason for this may be seen in the political and religious situation at the time, Lutheran and Reformed Church communities being uninterested in such works and Catholics holding back - in those cases where they had actually been able to keep their buildings. 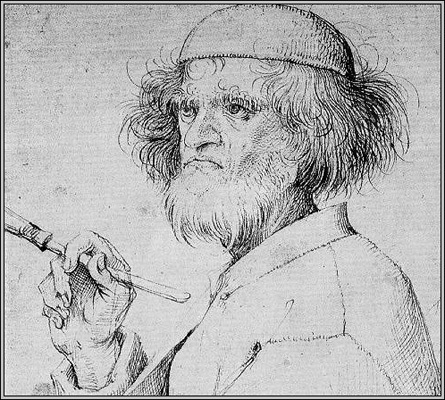 Another reason was Bruegel's style, which was such as to exclude him from consideration by Catholics. The strategy of the Counter-Reformation, as formulated at the Council of Trent in 1545-63, required artists to portray saints in a way which emphasized their sainthood and clearly distinguished them from other mortals. Bruegel did the very opposite. 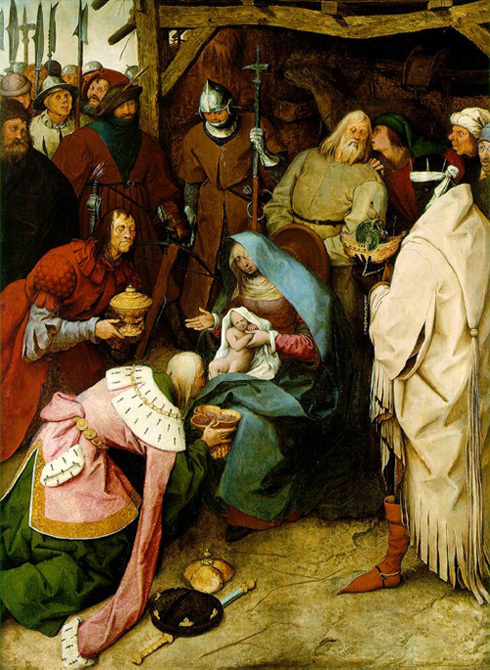 This is even true of a work which at first appears to correspond to Catholic requirements: The Adoration of the Kings (1564). Mary is depicted sitting in the centre of the picture, holding the Christ child on her lap. Her face is as beautiful as that of a young girl, quite capable of fulfilling the traditional Madonna ideal. One of her eyes is hidden, however; her posture is bowed; and the Christ child seems to be pulling back in fear. Furthermore, the face of the left-hand king - one of the saints after all - has very earthly features, while the brightly coloured robe of the right-hand king renders its wearer more prominent than Mary. The final straw - in the eyes of Counter-Reformation severity -is the depiction of Joseph: instead of giving himself over completely to the holy event, he is leaning towards an unknown person so that the latter may whisper something in his ear. One could reply that it is precisely through this act of whispering that respect is shown the Adoration. It is too human an act, however; it distracts the observer, and would undoubtedly have fallen victim to the religious censorship of art. 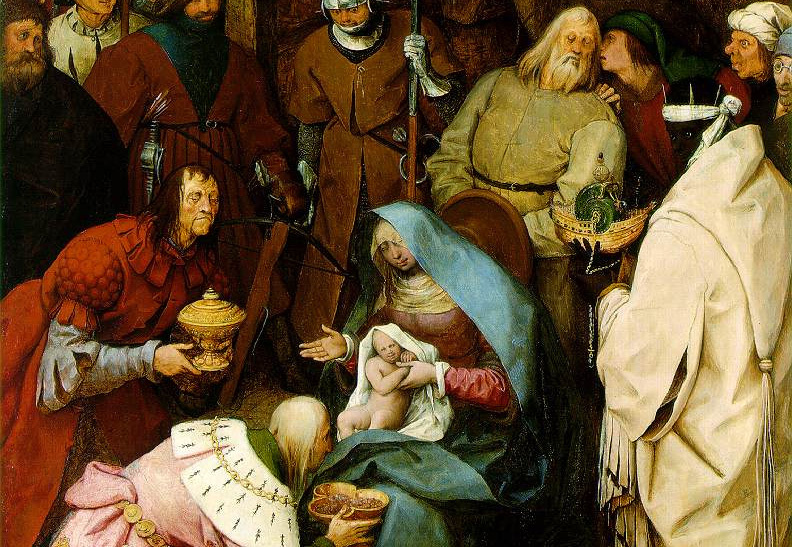 Bruegel painted the Adoration of the Christ child by the Three Kings or Magi three times; none of the works reveals the splendour and idealization considered appropriate in Catholic circles. The earliest painting, The Adoration of the Kings (between 1556 and 1562), which is in a poor state of preservation, is characterized by a large crowd of Netherlands and Middle Eastern people, the last, The Adoration of the Kings in the Snow (1567), by a natural event, namely by falling snow. This last version is also the boldest, the religious scene almost disappearing, integrated like some everyday occurrence into the life of a wintertime village. 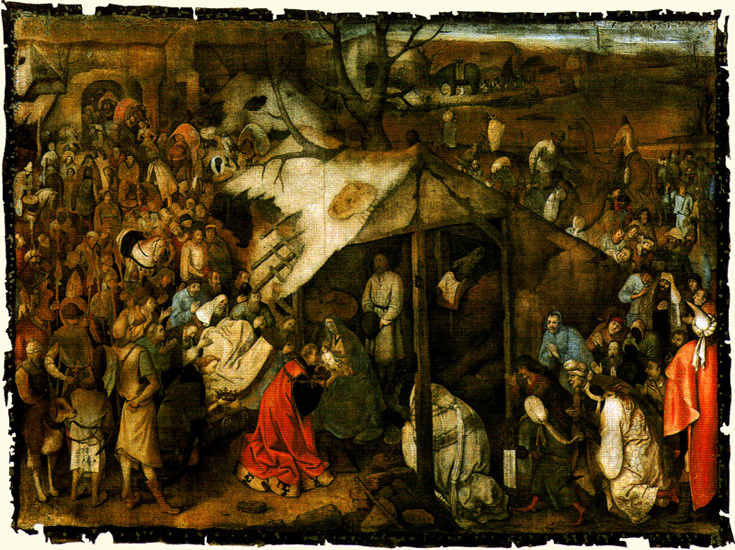 Bruegel depicts the Adoration as it could have been staged in a Passion play. It was admissible within the context of such plays that someone whisper something in Joseph's earnot, however, in the case of pictures, according to the guidelines laid down by the Counter-Reformation. 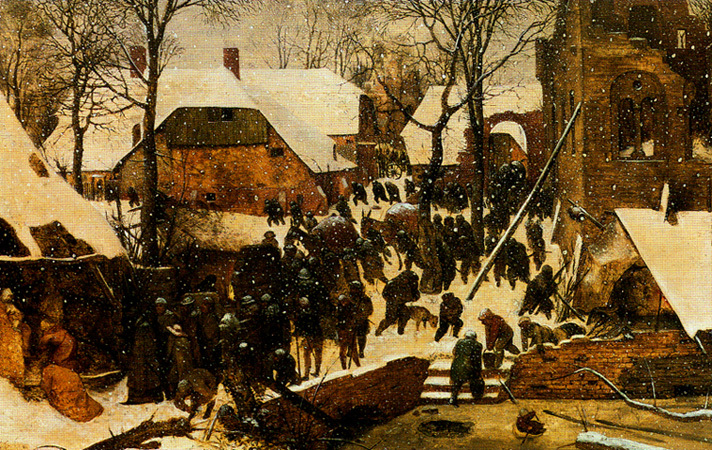 Bruegel has shifted the Adoration from the centre to the left-hand edge of the picture, depicting it rather indistinctly behind a curtain of snow. The work is characterized not by the religious motif but by a natural event and the life of the people in a village in wintertime. It is possible that we have here the first painting in the history of European art to depict falling snow. 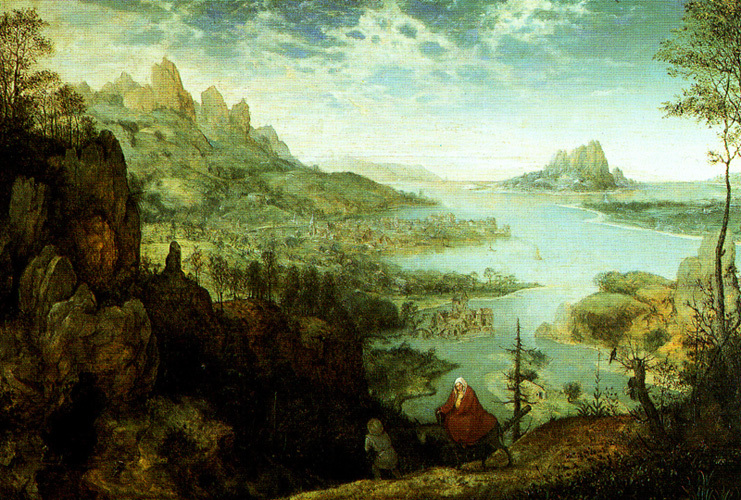 As is the case with many of his paintings, Bruegel has treated the biblical motif here as if it were merely of minor importance.